In addition to a new release, Smashing Magazine published an article that I co-authored with Federico titled “Diving Into Procedural Content Generation” which goes into detail about our motivations in creating WorldEngine (originally WorldSynth and Lands) and how by simulating real world phenomenon we can “create” realistic worlds, the results of which have been used by others for their own projects. I’ve been a member of OpenMW for a while now and with the recent advances in the OpenMW-CS (construction set), it has made it possible to create your own “game” and not have to rely on Morrowind or any other Bethesda IP. In this particular case, I’ve been working on the OpenMW-Template and OpenMW-Example-Suite. The Template is fully CC-BY 3.0 and can be used by anyone wanting to have something akin to a starter kit or SDK when using OpenMW and its CS. The Example-Suite is OpenMW’s own game using the Template as a basis but going further in demonstrating what the engine can do. OpenMW is currently going through the release candidate (RC) phase for 0.39 so please come help us test this out. Have a sneak peak at our new (WIP) release video of what’s new. One of the things I’ve been working on is getting height data (DEM) into OpenMW, such as ones created by WorldEngine. Introducing TESAnnwyn, originally open-sourced by Lightwave, I’ve been working to turn it into a library with a CLI and improving it even further by adding features and fixing bugs. 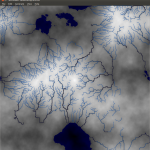 The result is that you can use GDAL to convert whatever DEM you might have, into a 32-bit signed raw (ENVI) file that can be read by TESAnnwyn and converted to an ESP full of terrain data! My hope is that one day it will have Python bindings so it can be used directly by OpenMW-CS. Here is an example of the result of a DEM that was reduced by 50% in terms of resolution and size running in OpenMW with all the setting cranked to max, including view distance. As you can see, we’ve come a long way and many of the projects I’ve been working on are cross pollinating. There is so much left to do! If you’re interested in any of the projects, please feel free to leave a comment and/or help!